In the Twentieth Century, no war seemed like a better idea beforehand and a worse idea after than the First World War. Most of Europe, and eventually the United States, marched merrily into what turned out to be a highly-efficient meat grinder destroying for many nations an entire generation of young men, all in the pursuit of what turned out to be not much. I think we Americans don't fully grasp to what degree war ravaged Europe in the Twentieth Century. Britain, for example, during World War I suffered 2.6 million dead and wounded out of a population of 45 million; and France's loss of 6 million dead and wounded out of 40 million would be the equivalent of 45 million casualties for the present-day U.S., losses not only unthinkable today but incomprehensible. Afterwards, the debate centered not so much on the question of "Should we have fought the war?" as on "How did we get suckered into it?" The level of disillusionment, grief and revulsion was so great, the key European powers sat back while Hitler gobbled up one country after another, and even after the Nazis had overrun most of Europe, invaded Russia and were bombing Britain on a daily basis, America's president, Franklin Roosevelt, had a hard time convincing the nation to even prepare for war, much less fight it. By the time the United States entered the conflict, it was damned near too late—and was, in fact, too late for millions of people. The effort to make sense of World War I and the political, social and economic upheaval of its aftermath inspired some of the finest art and literature of the Twentieth Century—cubism, surrealism, Picasso, Hemingway, Proust. Possibly the best novel about the war itself was Erich Maria Remarque's best-selling novel, All Quiet On The Western Front, the story of a classroom of German schoolboys on their journey from enthusiastic volunteers to disillusioned veterans to buried corpses. Carl Laemmle, the legendary head of Universal Studios, quickly bought the rights to the novel. Laemmle had worked as a bookkeeper for twenty years before investing in a string of nickelodeons, eventually founding his own film distribution company, Laemmle Film Service, which after a merger with three other film studios became Universal. He put his son, Carl, Jr., in charge of production and it was "Junior," as he was widely known, who produced All Quiet On The Western Front. In adapting the novel for the screen, writers George Abbott, Maxwell Anderson and Del Andrews retained the story's focus on the boys who fought and died in the war rather than on the generals and politicians who sent them, a focus that gave the book so much of its power. Director Lewis Milestone made the significant and (given that the studio was investing more than a million dollars in the production, a huge amount for the time, just weeks after the crash of the New York stock market) risky decision to cast young unknowns in the primary roles—and not in a J.J. Abrams, populate-the-bridge-of-the-Enterprise-with-GQ-pretty-boys sort of way either. This choice, casting schoolboys to play schoolboys, is nearly unique in the history of Hollywood. Kurt Vonnegut wrote in Slaughterhouse-Five that the problem with war stories is that instead of being about the children who actually manned the front lines they all pretend wars were fought by grown men, "played in the movies by Frank Sinatra and John Wayne or some of those other glamorous, war-loving, dirty old men" which he said made war "look just wonderful, so we'll have lots more of them." And indeed, Frank Sinatra and John Wayne and William Holden and many others were too old, too mature, too poised, too experienced, for the parts they played. Even the superb Saving Private Ryan relied on a cast—Tom Hanks (42), Tom Sizemore (37), Edward Burns (30), Matt Damon (28)—too old for the parts they played. With the exception of Louis Wolheim, a veteran of fifty movies including the Oscar-winning Two Arabian Knights, the cast of All Quiet On The Western Front is nearly as young as the parts they are playing. When the film went into production in November 1929, Russell Gleason and William Bakewell were twenty-one, Lew Ayres was twenty, Ben Alexander, eighteen. Richard Alexander (no relation) was the old man of the group at twenty-five. These are boys, raw recruits who soil their underwear during their first patrol, kids who've never been away from home, never had a drink, never so much as kissed a girl. Played by grown men, you might feel regret at their deaths, but you'd never get the same sense of how much is lost, how much of even the most basic aspects of life they've missed out on as when these parts are played by boys. The effect is tragic and poignant even now almost eighty years on. The other significant choice Milestone made was to focus strictly on the war from the point of view of the unglamourous foot soldiers who fought it. No strategic overviews, no explanations of political objectives, not even a crane shot of the battlefield to let you know where the men are headed. Just a boot's level view (often literally) of the hunger, sleeplessness, fear, filth, lice, loneliness, rats, madness, amputations, shelling and unheroic death that was the daily routine for millions of men. Without a greater sense of the war's purpose, Milestone forced his audience to focus on the only goal that mattered to these boys, their survival. Milestone strove for an unprecedented level of realism as he directed the action, drilling his actors like soldiers and casting veterans of the German army in supporting roles. 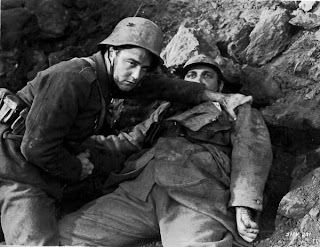 The effort especially paid off in an extraordinary sequence late in the film: an attack, counterattack and counterattack repulsed, nearly all of it shown from Lew Ayres' point of view as he shelters in a bomb crater, with, first, French soldiers leaping the hole in one direction, then leaping it in the other as the Germans drive them back, finally one unfortunate French soldier leaping on top of Ayres leading to a desperate struggle with a bayonet. Then during the day and night that follow as Ayres is trapped in no man's land between the two lines, he watches the French soldier's life slowly drain away, the plight of the Frenchman told in sound from his screams, his cries and finally his silence. 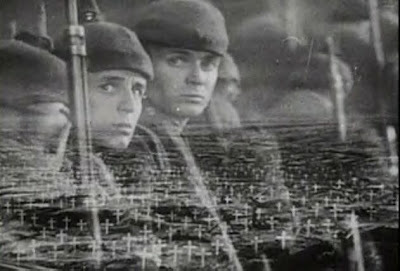 The movie concludes with a shot long thought lost but rediscovered in 1998 when the film was finally restored to its original length: the silent, ghostly image of the boys we've come to know marching off to war superimposed over acres of white crosses. 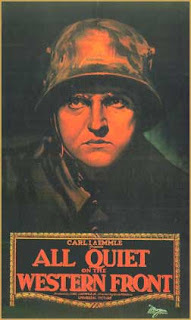 All Quiet On The Western Front premiered in Los Angeles on April 21, 1930, and was a critical and commercial success, grossing $3 million, more than twice its budget. The National Board of Review named it one of the ten best movies of the year, Photoplay magazine awarded Laemmle, Jr. the Medal of Honor for producing the best movie of the year. The movie even won Japan's Kinema Junpo Award for best foreign language film. 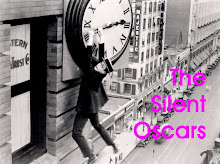 On November 5, 1930, the Academy awarded it two Oscars, for best picture and best director. Decades later, the National Film Preservation Board included All Quiet On The Western Front in the National Film Registry. In 1998, the American Film Institute included the film on its list of the 100 best American movies ever made and ten years later ranked it seventh among the list of best "epic" features. Steven Spielberg later acknowledged its influence on Saving Private Ryan. 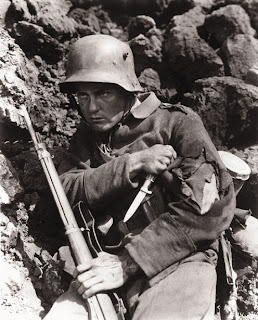 In my opinion, not only was All Quiet On The Western Front the best picture of 1930, it's one of the five best (anti-)war movies ever made and arguably was the best film of the entire Early Sound Era (1927-33). Lew Ayres was so moved by the experience of making All Quiet On The Western Front that he became a conscientious objector during the Second World War, a controversial stand that led the U.S. military to broaden its definition of conscientious objection. After serving in the Medical Corps in the South Pacific, Ayres returned to Hollywood and was better than before he left. Already a star of the Young Dr. Kildare movies, Ayres went on to receive an Oscar nomination in 1949 for his role in Johnny Belinda. He worked steadily until 1994 and died in 1996 at the age of eighty-eight. Although Ayres was the only member of the cast to enjoy stardom after the film's successful run, the rest of the cast continued working in small roles, some well into the television age. Pat Collins, who played Lt. Bertinck, fought in both world wars and was a regular in Westerns until his death in 1959. Ben Alexander played Officer Frank Smith on the first television run of Dragnet in the 1950s, and Harold Goodwin, Richard Alexander and William Bakewell made regular appearances on television into the 1970s. Russell Gleason and Owen Davis, Jr., worked in the movies until they were killed in separate accidents, Gleason from a fall in 1945, Davis by drowning in 1949. Louis Wolheim, the veteran actor who so memorably played Ayres's mentor, Sgt. Kat Katczinsky, died of stomach cancer within a year of the film's premiere. For producer Carl Laemmle, Jr., All Quiet On The Western Front ushered in an era of big hits for Universal Pictures including Dracula, Waterloo Bridge (1931), Frankenstein, The Mummy, The Invisible Man, Bride Of Frankenstein and Show Boat. Unfortunately, Junior routinely spent more on his productions than they ever hoped to recoup at the box office and despite the lasting appeal of his films, Universal was virtually bankrupt by the mid-Thirties. 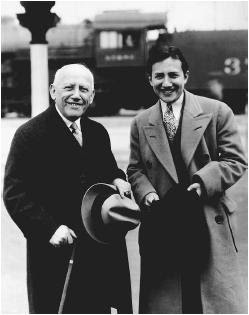 In 1936, Universal's New York backers forced the Carl Laemmle and his son into retirement. Until his death in 1939, the elder Laemmle, himself a German Jewish immigrant, provided the financial support and political influence to bring hundreds of Jews from Nazi Germany to the United States. Carl, Jr. died forty years to the day after his father. Neither man ever again produced another picture. Postscript: Arthur Gardner and Glen Boles, who had small, uncredited parts as students, are the only cast members still living as of this posting. Gardner, who went on to produce two long-running television series, The Rifleman and The Big Valley, later recounted his experiences working on All Quiet On The Western Front. "[Carl Laemmle] brought a man over from Germany who trained all of us in German military drills for two weeks on the back lot. That man was an early Nazi. I was a very happy-go-lucky kid, had a sense of humor which thank God I still have, and played practical jokes. One day, I played one that he didn't appreciate and he lost his temper, and said, 'Goldberg, you goddamn Jew, I warned you not to do that—you're fired.' The man was an idiot. Lewis Milestone, the director, was Jewish. George Cukor, the dialogue director, was Jewish. They called him up and fired him on the spot and put me back on the picture. But from then on, I was not quite so playful." OK, i used to try to be amused but now i am disgusted that I STILL haven't seen this movie. After this review, it's moved to the top of my must-see list. Thanks for the great accounting, and -- as always -- for the fascinating back stories. If you're the least bit worried that watching All Quiet On The Western Front is like taking your medicine or eating your spinach, it isn't. It's a very entertaining, watchable movie that also just happens to be intense and thoughtful and moving. My brother who sometimes comments here as Uncle Tom includes it on a short list of his favorite movies and you're not going to find any spinach or medicine on his movie watching list. Ha! Thanks, & you know my type too well -- I think there's been more than a touch of spinach fear in play for me. It's the same "now you eat that, it's good for you" ingredient that's caused me to rent Schindler's List multiple times and then, at the last second ... not watch it!